Help your child master the subtraction facts in just minutes a day with this fun, engaging program. Help your child master the subtraction facts in just minutes a day with this fun, engaging program. 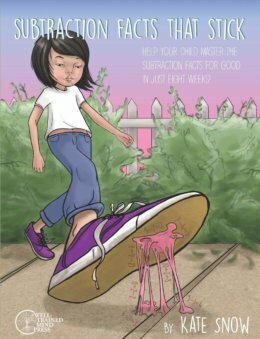 Subtraction Facts That Stick will guide you, step by step, as you teach your child to understand and memorize the subtraction facts, from 2 -1 through 18 – 9. Hands-on activities, games your child will love, and simple practice pages help your child remember the subtraction facts for good. In 15 minutes per day (perfect for after school, or as a supplement to a homeschool math curriculum) your child will master the subtraction facts, gain a greater understanding of how math works, and develop greater confidence, in just 8 weeks! Mastery of math facts is the foundation for all future math learning. Lay that foundation now, and make it solid, with Subtraction Facts that Stick. And check out our other math programs, Addition Facts That Stick and Preschool Math at Home. Kate Snow is a math educator on a mission to help parents raise kids who are capable and confident at math. A homeschooling mother of two, she holds a B.A. in Mathematics from Harvard, and an M.S. in Elementary Education from Walden University. She writes at kateshomeschoolmath.com.